Ciarán has been commissioned by RTÉ Performing Groups to write a new work for the RTÉ Concert Orchestra. Following on from the critically acclaimed setting of Paddy Bushe’s poem 'Hopkins on Skellig Michael’, which was recorded by the RTÉ CO with narration by Barry McGovern for the CD Perfect State , this new piece will be entitled 'Spirit of the Sea'. The RTÉ Concert Orchestra has been cherished by Irish audiences throughout its 60-year history, whether performing with international stars such as Luciano Pavarotti, Placido Domingo, Kiri Te Kanawa and Ute Lemper or with leading Irish artists ranging from Cara O'Sullivan and Virginia Kerr to Altan and Declan O'Rourke. With an unrivalled repertoire, the RTÉ CO appears at leading national and international festivals, on RTÉ Radio and Television and in the opera house, while through its commercial releases its recordings are distributed worldwide. The orchestra's education programme is presented nationwide to tens of thousands of young people as the RTÉ/The Irish Times Music in the Classroom series. The RTÉ CO has been heard across the world in seven Eurovision Song Contests and its commercial recordings embrace many styles from the phenomenally successful Riverdance to Declan O'Rourke's Big Bad Beautiful World. Recently the RTÉ CO gave memorable concerts with Ute Lemper, Emma Kirkby, Lesley Garrett, Curtis Stigers, jazz legends Cleo Laine and John Dankworth and Duke Special. The RTÉ CO has an extensive discography on the Marco Polo, Naxos and RTÉ lyric fm labels. 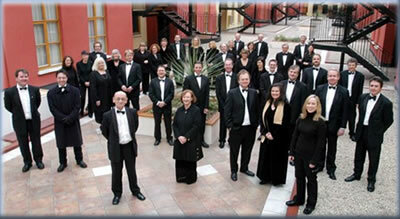 This new work is due to be premièred at The National Concert Hall in Dublin during the 2009 concert season. Watch this space for further details!